Home again from the annual time-traveling pilgrimage to Pennsic War in Slippery Rock, PA. Each year I long to continue that life when I return home, but it really is impossible. Stop pining away and enjoy it while you can! Purchases this year were typical: fabric, a few new pins, some trim. Nothing wildly exciting. I did splurge on a new card weaving book. When I first joined the SCA, I played around with card weaving a bit. Because I would tie the yarn to my belt for weaving, I found it difficult to travel (or answer the phone or get a snack). Eventually I purchased a small rigid heddle loom that removes these problems. About two years ago I bought a new pack of cards and this year I got a new book. It’s going to happen this time! When we got home on Saturday, one of the first things I did was dig out my little loom. It was buried in the corner under about 10 fleeces. 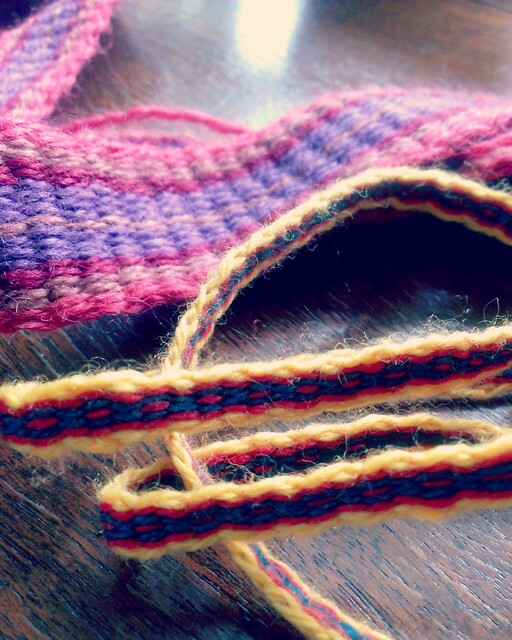 Since inkle bands are a little easier to jump into, I started with that as a refresher. The first one was rather wonky, the second looked better, and by the third, I wasn’t too bad. I’d like to get a little more consistent, and then I can weave my own trim and straps and thingies galore! My ultimate goal is to make myself a new belt to fit the new buckle I bought from ThorThor’s Hammer (the best place ever!). In the SCA we tend to rely heavily on leather belts, turning them into the “Batman utility belt” with many pouches and dangly bits. I’m trying to get away from this and going towards a woven belt. Usually when I see them, they are tied in a big knot. I do not like this look. Why can’t I use a buckle? Who says they didn’t? Are there any definitive sources stating otherwise? I’m doing it. But not today.